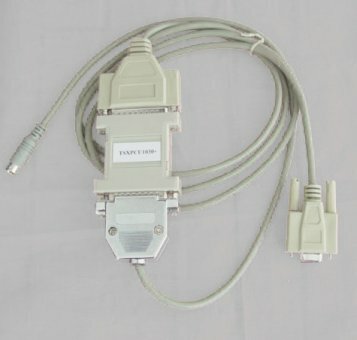 optoelectronic isolated USB interface TSXPCX3030 cable,connect the TER port of PLC. TSXPCX3030+ is a multi-function programming cable which provides the serial connection and RS485 signal conversion through the USB interface. The cable is photoelectric isolated, with the overcurrent,surging, and transient overvoltage protection circuitry, which can be hot plug. It supports the long-distance communication. TSXPCX3030 + can be used for Modicon TSX Series PLC and PC or other equipment which don’t provide the traditional serial port for communication. The cable can connect with the TER communication port of TSX Premium (57), TSX Micro (37), TSX Nano (07), TSX Naza (08) and Twido PLC. The snap switch located on the TSXPCX3030+ programming cable are used to choose different operating modes. The cable rejects the way which the transceiving of the RS485 is controlled by the PLC, and all the data transceiving is automatically controlled. It can be used for multi-point and point-to-point communication applications. TER port of the TSX Series PLC have a DPT signal pin, which is used to determine its working mode. If the DPT is high-level, TER always work in the Uni-Telway Master (master station) mode, and it need under this mode for PLC programming. If the DPT is low level, the working mode of TER is decided by the PLC. This product is the USB to RS485 isolated converters which with the protection, so it’s need to use the power of USB port and TER port. Due to the AUX expansion communications interface of PLC has no power-pin, the product do not support Communicating with AUX port. ● voltage of Optical Isolator: 1000 VDC (up to 3000 VDC, it should be declared when making an order). ● baud rate: 300 bps ~ 1Mbps automatically adaptive. TSXPCX3030+ needs to install USB device drivers at first. And to communicate with PLC needs the latest version of the Uni-Telway or MODBUS driver. These drivers are usually included in the programming software on CD-ROM And for the specific installation steps, please refer to the instruction files on the CD-ROM drivers, and details are not necessarily listed here. Double-click on the icon, then achieve the settings, XWAY Test, MODBUS Test communications test of the serial ports (COM slogan) which is connected with TSXPCX3030+ cables. Then the programming software can be used to complete the normal communication with the PLC. The largest communications range between the TSXPCX3030+ and PLC are up to 2 kilometers (9600 bps),when external plus terminals 120 ohm resistance, an 100mA power and a 5 VDC power on the RS485 ports (8 pin Mini DIN Male) of the cable. And a FSACC01 Isolators Box (Schneider's model: TSXPACC01) is need to install at the end of PLC. 0.5 mm2 unshielded twisted pair lines are used for Communications. When the distance is Over 500m, a RS485 repeaters (model: E485GP), can be installed for extending the distance.